TekSynap is a fast growing high-tech company that understands both the pace of technology today and the need to have a comprehensive well planned information management environment. “Technology moving at the speed of thought” embodies these principles – the need to nimbly utilize the best that information technology offers to meet the business needs of our Federal Government customers. We offer our full time employees a competitive benefits package to include health, dental, vision, 401K, life insurance, STD (short term disability), LTD (long term disability) plans and vacation time and holiday leave. 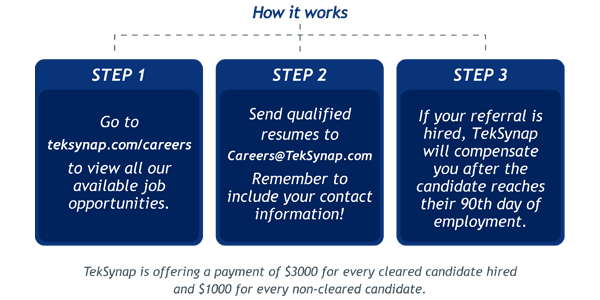 To apply please search for a job below and use the online application system or email us at careers@teksynap.com.